American physician mission specialist astronaut 1996-2008. Status: Inactive; Active 1996-2008. Born: 1959-04-24. Birth Place: West Point, New York. Grew up in Novato, California. Educated West Point. US Army officer. PERSONAL DATA:� Born in West Point, New York, but considers Novato, California, to be her hometown.� Enjoys jigsaw puzzles, juggling, skating, hiking, music, writing, public speaking, and historical novels. EDUCATION:� Novato High School, Novato, California, in 1977; received a Bachelor of Arts in Biochemistry from San Francisco State University in 1981, and a Doctorate in Medicine from the University of Washington in 1985.� Transitional internship at Highland General Hospital, Oakland, California, in 1985.� Received certification in Aerospace Medicine from the School of Aerospace Medicine at Brooks Air Force Base, Texas, in 1988.� Completed residency in at Ghent Family Practice at Eastern Virginia Medical School in 1992.� Received certification as a senior aviation medical examiner from the Federal Aviation Administration in 1995. Received an honorary Ph.D. in Humanities from Fordham University in 2014. ORGANIZATIONS:� Boys and Girls Club; Aerospace Medical Association; Third Baptist Church; American Academy of Family Physicians. AWARDS: Outstanding Young Women of America; National Defense Service Medal; Air Force Achievement Medal; U.S. Air Force Air Staff Exceptional Physician Commendation; National Technical Association Distinguished Scientist Award; Commendation Marin County Board of Supervisors; Commendation Novato School Board; Honorary Ph.D. in Humanities, Fordham University; Honorary appointment, University of Wisconsin-Madison. EXPERIENCE: Cagle’s medical training was sponsored by the Health Professions Scholarship Program, through which she received her commission as an officer with the United States Air Force, and subsequently was awarded her board certification in family practice. During her initial active duty tour at Royal Air Force Lakenheath, United Kingdom, she was selected to attend the School of Aerospace Medicine at Brooks Air Force Base, Texas. In April 1988, she became certified as a flight surgeon logging numerous hours in a wide range of aircraft. She was actively involved in mission support of aircraft providing medical support and rescue in a variety of aeromedical missions. NASA EXPERIENCE: During May 1989, while a flight surgeon assigned to the 48th Tactical Hospital, United Kingdom, Cagle volunteered to serve as the Air Force Medical Liaison Officer for the STS-30 Atlantis shuttle mission to test the Magellan spacecraft. She was assigned to the Trans Atlantic Landing (TAL) site at Banjul, West Africa, to provide emergency rescue and evacuation of the shuttle crew should it have been required. Cagle has contributed ongoing data to the Longitudinal Study on Astronaut Health, and served as a consultant for space telemedicine. She was a member of the NASA Working Group and traveled to Russia to establish international medical standards and procedures for astronauts. She also conducted health screenings of Mir-18 consultants from the Russian Federation. Born April 24, 1959 in West Point, New York, but considers Novato, California, to be her hometown. Enjoys jigsaw puzzles, juggling, skating, hiking, music, writing, public speaking, historical novels. Novato High School Novato, California, in 1977; received a bachelor of arts degree in biochemistry from San Francisco State University in 1981, and a doctorate in medicine from the University of Washington in 1985. Internship at Transitional Highland General Hospital, Oakland, California, in 1985. Received certification in Aerospace Medicine from the School of Aerospace Medicine at Brooks Air Force Base, Texas, in 1988. Completed residency in family practice and GHENTFP at Eastern Virginia Medical School in 1992. Received certification as a senior aviation medical examiner from the Federal Aviation Administration in 1995. Boys and Girls Club; Aerospace Medical Association; Third Baptist Church. Outstanding Young Women of America; National Defense Service Medal; Air Force Achievement Medal; United States Air Force (USAF) Air Staff Exceptional Physician Commendation; National Technical Association Distinguished Scientist Award; Commendation Marin County Board of Supervisors; Commendation Novato School Board. Dr. Cagle's medical training was sponsored by the Health Professions Scholarship Program, through which she received her commission as a reserve officer with the United States Air Force, and subsequently was awarded her board certification in family practice. During her initial active duty tour at Royal Air Force Lakenheath, United Kingdom, she was selected to attend the School of Aerospace Medicine at Brooks Air Force Base, Texas. In April 1988, she became certified as a flight surgeon logging numerous hours in a diversity of aircraft. She was actively involved in mission support of aircraft providing medical support and rescue in a variety of aeromedical missions. From 1994 to 1996, Dr. Cagle served as the Deputy Project Manager for Kelsey-Seybold Clinics, practicing as an occupational physician at the NASA-JSC Occupational Health Clinic. In addition to conducting job-related exams, routine health screenings, and providing acute care for on-site injuries and illness, she designed the medical protocols and conducted the screenings for select NASA remote duty operations. Dr. Cagle is a certified FAA Senior Aviation Medical Examiner, is ACLS Instructor qualified, teaches fitness courses. Dr. Cagle is a Clinical Assistant Professor at UTMB, Galveston. . She served on the Volunteer Family Practice Clinical Faculty at the University of California, Davis, California. Dr. Cagle is a lieutenant colonel in the USAF Reserves, currently assigned to the Pentagon Flight Medicine/Special Mission Clinic. During May 1989, while a flight surgeon assigned to the 48th Tactical Hospital, United Kingdom, Dr. Cagle volunteered to serve as the Air Force Medical Liaison Officer for the STS-30 Atlantis Shuttle Mission to test the Magellan Spacecraft. She was assigned to the Trans Atlantic (TAL) landing site at Banjul, West Africa, to provide emergency rescue and evacuation of the shuttle crew should it be required. Dr. Cagle has contributed on-going data to the Longitudinal Study on Astronaut Health, and has served as a consultant for space telemedicine. She was a member of the NASA Working Group and traveled to Russia to establish international medical standards and procedures for astronauts. She also conducted health screenings of Mir-18 consultants from the Russian Federation. Selected by NASA in April 1996, Dr. Cagle reported to the Johnson Space Center in August 1996 to begin two years of training and evaluation. Successful completion of initial training will qualify her for various technical assignments leading to selection as a mission specialist on a Space Shuttle flight crew. Family: Astronaut. Country: USA. Agency: USAF. Bibliography: 12, 5231. 1959 April 24 - . Birth of Yvonne Darlene Cagle - . Nation: USA. Related Persons: Cagle. 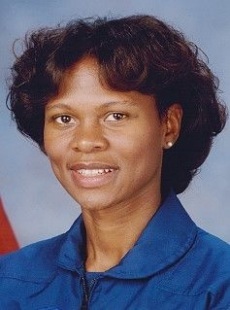 African-American physician mission specialist astronaut, 1996-on..